My Online Kitchen-Indian Veggies: Welcome to My Kitchen BLOG!!!! Welcome to My Kitchen BLOG!!!! Welcome to my Kitchen Blog! :) This blog provides delicious,traditional, vegetarian, South Indian Recipes from my mom's(Amma's) kitchen. Most Tamils are vegetarian by cultural tradition or necessity. Tamil cooking almost always involves a process called “tempering”—quickly sauteing a few spices that become the base of (or are added to) most dishes. Tamilians and most south Indians follow an eating pattern that is a different from that of northern India as well. Rice, as in most of north India, is the basis of the meal. It is served, however, with three basic types of accompaniments. In this order, a Tamil meal would include rice served with a sambhar (made with tamarind); rasam (a tart and spicy soup—really, almost a drink); and finally “curd” or yogurt (plain or mixed with vegetables or fruits or accomapanied with rice). 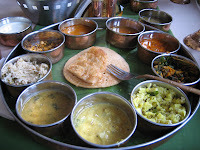 Other drier types of curries, chutneys and pickles, and Indian breads/chapathi might round out a meal. Tamilians love Payasam or Kheer which is taken as a dessert. most poor Tamils sustain themselves with a little rice or ragi and maybe a rasam and some yogurt. Ragi is a red grain grown in south India. You can find finely-ground ragi flour (commonly used in India rota breads) in Indian stores. The ragi consumed by poor Indians is generally much coarser. Tamarind is the date-like fruit of a large Indian tree. Indian groceries will usually carry tamarind pulp, which contains seeds. Tamarind pulp must be soaked in hot water, which is then strain to remove the seeds, before use. You can also buy tamarind concentrated, seedless tamarind paste. You add it to hot water and stir to dissolve before using in recipes.... I use 2-3t of tamarind paste per 1c of soaking water called for in recipes. Tamarind is quite sour; lemon juice can be substituted when called for in tiny amounts. Asofoetida (“heeng”) usually comes in powder form and is made from a dried resin. It is very, very pungent and on its own not very desirable. It’s one of those things like anchovy (think Worchestershire Sauce) that rounds out dishes and is indistinguishable in judicious amounts. You would only use a pinch in most dishes and you can omit it. Some cooks use a little garlic as a substitute. Toor Dal are split and spinned pigeon peas, sometimes confusingly called “red gram dal.” They are yellow. Toor Dal is a central ingredient (adding body) in sambars and rasams. Cooking it in water is the first step in making either. I find that toor dal takes about 30-40 minutes to cook to a very soft state necessary for these dishes, although time may vary. You should be able to mash it easily with a fork. In Tamil recipes, you do not drain the dal before adding it to sambars and rasams. Whole Spices and Dried Coconut and Legumes are often ground to make pastes that season and thicken south Indian dishes. If you use a recipe that calls for a paste containing these ingredients, be sure to grind them very, very finely—otherwise the texture won’t be very pleasant. I’ve adapted the recipes here so that you don’t need to worry about this. Ghee is clarified butter from which the milk solid have been removed so that it can be used for frying. (Milk solids in butter burn at a relatively low temperature—think about how fast butter browns—thus making whole butter a poor frying medium.) Ghee is sold in Indian stores and many others, but process is easy to do and you’ll find directions easily on the internet. For the recipes I’ve included, whole butter will work fine as long as you are careful with your cooking temperature and watch it carefully. Curry Leaves are small and flavorful but have nothing to do with curry powder (a spice blend). They are used in tempering. Fresh are best and many Indian stores will carry them. If you can’t find them, however, don’t worry. Sambar and Rasam Powders are spices mixes, just like curry powder. You can make your own or purchase the mixes in Indian stores. They vary by brand and by cook, but generally contain the same basic ingredients.